Convocation 2015 shaped up to be more retreat than lecture series, but it promised to be a place to find both knowledge and nourishment, to satisfy the hungers and heal the hurts of head and heart. Placing the mythological imagination of the scriptures in conversation with modern ecological and scientific imagination, Elnes de-mystified the mystics, revealing a hidden fullness within emptiness, strength within failure, virtue within temptation, and clarity that comes from first getting lost in the Dark Wood. Dr. Elnes closed our time drawing on his long experience as a national Christian leader offering important insight into how time spent in the Dark Wood by various Mainline and other denominations has led to a moment pregnant with hope and opportunity, which some are calling The Great Convergence. Dr. Elnes’ work has been described as “reflecting the heart of a mystic, the soul of a poet, and the mind of a biblical scholar,” who shows us how to “follow the Spirit in an age that is appropriately skeptical of spiritual claims.” This event was a retreat for anyone, clergy or laity, who feels awkward in their search for God, anyone who seeks to find holiness amidst their holy-mess, and anyone who seeks real, concrete reasons for hope in a Christian landscape that has often seemed bleak or barren. 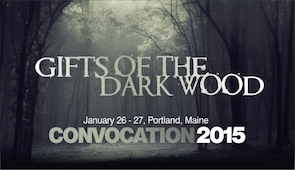 His upcoming book, Gifts of the Dark Wood: Seven Paths Beyond Religious Certainty That Point the Way Home, will be published by Abingdon Press in January, 2015. Dr. Marcia McFee, a nationally-known expert on worship and the arts weaved experiences of the Dark Wood with music, visuals and media throughout the course of the conference — offering mystical, worshipful and imaginative entrance points into our small group discussion and personal journeys through the Dark Wood. She also brought insight into the beauty of the “liminal” (in-between) places and how our worship can embrace these important rites of passage through times of emptiness, loss, struggle and uncertainty. Dr. McFee is the Curator and Visionary for the Worship Design Studio, an online site for education and inspiration about worship design and teamwork (www.marciamcfee.com).